Life is all about relationships and, more than that, about finding life’s special people. When I find someone extraordinary, I pull everything out of the, proverbial, hat to keep them as close to me as possible. It took a bit of doing to convince Karen to work with me to produce my regular double-page spread in the Weekend Witness. That, after working together for nearly three years, is now history. It started late one November which, in this industry, is always a very busy time. I received a phone call from the editor of a magazine; she wanted me to create 12 recipes to the song The Twelve Days of Christmas. I went to a huge amount of effort to give each recipe a South African touch, bearing in mind that each dish had to be prepared at the appropriate time. For example, on day 12 you could be making the Christmas Cake (I know you should do this much earlier but I only had 12 days! ); and then on day two you would be serving a robust-flavoured, red-wine poached-apple/pear topping on a homemade puff round with Amarula ice cream. On day one you would be making the roast turkey with stuffing which I, in that instance, made the suggestion to rather cook guinea fowl. So, that was the idea. Karen was sent to shoot the article - little did I know where this meeting would lead. 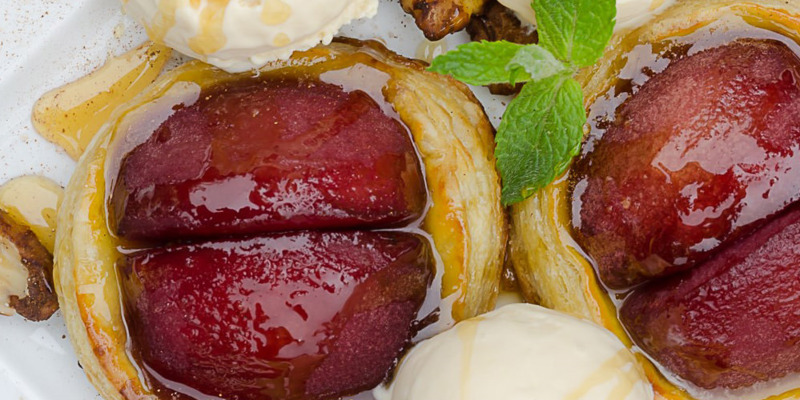 I’m not sure whether it was the poached-apple puff tart or the Amarula ice cream that convinced her to keep coming back for tasters. At that stage my sous chef, Elaine Boshoff, and I were taking very unprofessional photographs with our very basic cameras. With her keen eye, Karen made a huge difference to our column all those years back. As a tribute to this special friend, I asked Karen to send me her choice of the six best photographs that she had taken of my food for The Witness column. As with most of her suggestions, my smoked salmon trout terrine is light, fresh and simply delicious. I consider it an ideal way to make and present smoked salmon trout. I hope we taught her some cooking tips along the way. Served with our health bread, it’s truly exceptional. I have often included it in my column as it is the most asked-for recipe of mine. You can also find it in my cook book: Jackie Cameron Cooks at Home. After every shoot Karen went home with 'padkos' which often included a few slices of my bread. I am happy she included the picture of trout spring rolls with sweet-chilli sauce. It brings back memories of such a happy day. The weather was glorious, the laughs were uncontrollable and the entire team got stuck in to find all the fishing equipment that was available to use as props for the shoot. I suggest getting your trout from Wayfarer Trout in Dargle (Sue: 082 415 3780). We voted this the best fish in the country at last year’s Eat Out Produce Awards. Why? Because it is! You simply have to try it. The students at the Jackie Cameron School of Food & Wine had the opportunity to go to Sue’s farm last week and now they understand the entire process. Her place is a little piece of heaven. Karen’s photograph of my chocolate profiteroles clearly illustrates how tasty these little chocolate delights are. I would have a chocolate profiterole every day of my life; if that was at all possible. I have given up buying them because I’m always disappointed in what I’m served. My Aunt Molly pretty-much brought us up on these. When you have tasted the best, there is no compromising on quality. I tell my students that once they have been educated in what something should taste like then they have an opinion and can make an educated comment. This was made clear when they recently visited Greenfields, a farm in Mooi River. There, Cathy explained the difference between feed-lot beef and grass-fed beef. If you don’t know the difference I suggest you find out for yourself. I’m not sure whether it was the poached-apple puff tart or the Amarula ice cream that convinced Karen to keep coming back for tasters. I hope we taught her some cooking tips along the way. Served with our health bread, it’s truly exceptional. I have often included it in my column as it is the most asked-for recipe of mine. 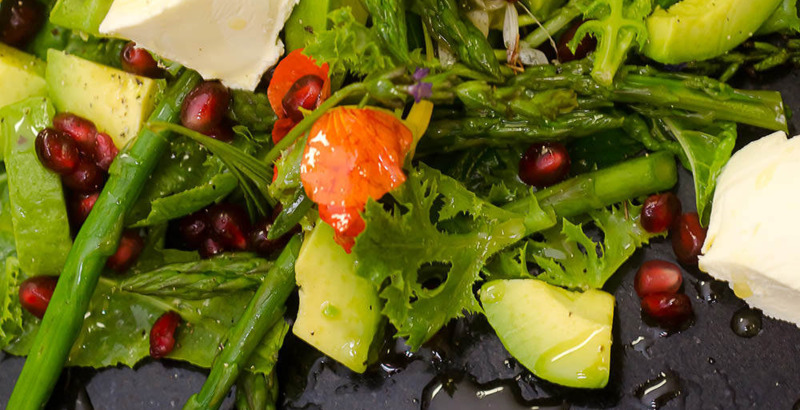 The avocado-and-asparagus salad was from our last shoot together so it was a very memorable day - busy but unforgettable. This smoked salmon trout terrine is light, fresh and simply delicious. I consider it an ideal way to make and present smoked salmon trout. I am happy she included the picture of trout spring rolls with sweet-chilli sauce. It brings back memories of such a happy day.The weather was glorious & the laughs were uncontrollable. Karen’s photograph of my chocolate profiteroles clearly illustrates how tasty these little chocolate delights are. 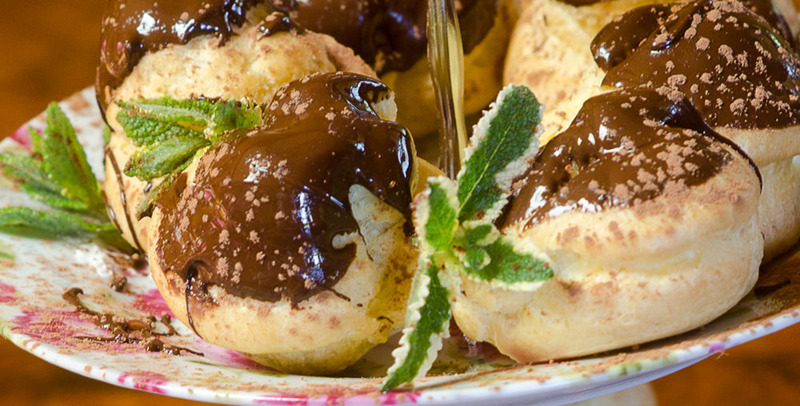 I would have a chocolate profiterole every day! I’m grateful to Karen for her support and enthusiasm to get the perfect shot; as well as her willingness to go the extra mile. This was literal when I moved to Hilton and she had to travel to me. She’s a person from whom one can always expect an honest opinion. She goes where angels dare to tread but, with this, she has deep concern for everyone’s well-being. We had many happy times together and, at times, we would be chatting so much that we would have to stop and count how many dishes we had photographed to be sure not to miss one out. I know many Midlands families who have had her take family, celebratory or wedding photographs; Karen is a person that everyone warms to. On behalf of all who know her, I wish Karen the success and happiness she deserves while overseas and I look forward to welcoming her back in the not too distant future – and to that glass of wine and tales of her travels. Hamba Kahle, Karen. Jackie Cameron, owner of Jackie Cameron School of Food & Wine situated in Hilton, KwaZulu-Natal - email for inquiries. For the latest on local foodie news add me as a friend on Facebook. Find me on Twitter - @jackie_cameron and Instagram: jackiecameronincolour. All Photos taken by Karen Edward’s Photography.